On my most recent adventure in The Secret Recipe Club, I had a hard time deciding between two recipes from my assigned blog, “A Taste of Home Cooking”. I went with Orange and Rosemary Pork Tenderloin, but couldn’t wait to make possibility number 2, a recipe that took me straight back to my California days. This might surprise you, but when I arrived in the US for the first time in 1986, both me and my former husband had zero experience with frozen dinners, as they didn’t exist in Brazil back then. We were amazed! Those cute little boxes ready to warm up and enjoy, so many options, so convenient! We went TV-dinner-crazy, trying all sorts of brands and styles of cuisine. Once the thrill of the novelty passed, we went back to our regular approach of home-cooked meals, but I never lost a soft spot for “Swedish Meatballs with Noodles”. That little frozen box, and Velveeta (there, I said it!) are a bit disturbing for a food blogger to love, but… I am guilty on both counts. I’ve got nothing to say in my defense about Velveeta, but I’m redeeming myself on frozen dinners with this home-cooked version of a favorite classic. 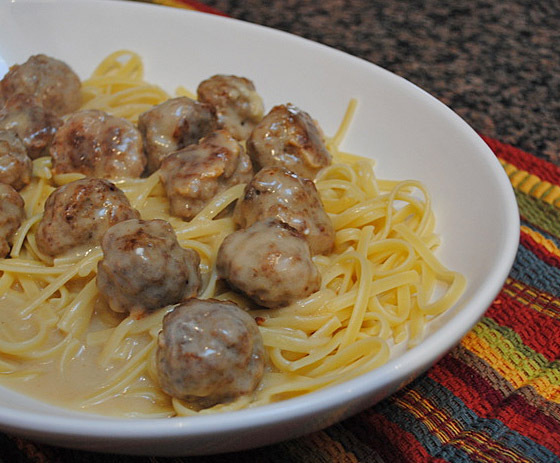 Mix all the ingredients for the meatballs in a bowl, and form bite-size balls, placing them on a baking sheet lined with parchment paper or aluminum foil. Bake for 12 to 15 minutes, turning them midway through cooking time. As the meatballs bake, boil water for the pasta and start preparing the sauce. Melt the butter over medium heat, sprinkle the flour over it, and cook for a couple of minutes, whisking constantly. Slowly add sherry and whisk until the sauce reduces by half. Add beef broth in a slow stream and continue stirring until the sauce thickens enough to lightly coat the back of a spoon. Turn off heat and add salt and pepper to taste, Dijon mustard and sour cream. Once the noodles are cooked, drain them and toss with butter. Turn a low heat under the sauce to gently warm it, add the baked meatballs to the sauce, stir to coat, and serve over pasta. Comments: This was a delicious meal, quick and simple to prepare. Next time, I will make two small adjustments: bake the meatballs slightly less, so they will be lighter in color, and use the full amount of sour cream in the sauce. If A Taste of Home Cooking is not on your list of blogs to visit, jump right over, she’s got a ton of great recipes to share!